Corded Mono Ear Gear Sleeves with special fabric protect pricey aids. Your hearing aids are protected from sweat, moisture, dirt and loss, and feels great, too! Can be attached to clothing with corded clip. Cordless Binaural Ear Gear Sleeves 2-pack protects pricey aids. From sweat, moisture, dirt and loss, and feels great, too! Numerous Hearing Aids get destroyed prematurely due to moisture, dust and dirt. PROTECT YOUR INVESTMENT with the only American-made Hearing Aid Sweat Band™. Don't settle for less, Get Your ORIGINAL Hearing Aid Sweat Band™ today! 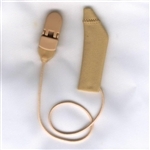 Corded Binaural Ear Gear Sleeves protect aids, clip to clothing. Soft, comfortable fabric keeps pricey aids free of sweat, moisture, dirt. 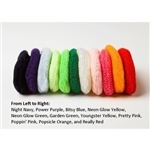 These sleeves are securely corded with a plastic clip for your collar or pocket. Ear Gear Cochlear safeguards implants from loss and damage.